De Blasio, an outspoken Trump critic, said the statue "means so much to the people of New York," especially the city's women and girls. NEW YORK: The popular bronze statue of a young girl staring down a bull on Wall Street will stay in place until March 2018, New York Mayor Bill de Blasio announced Monday. 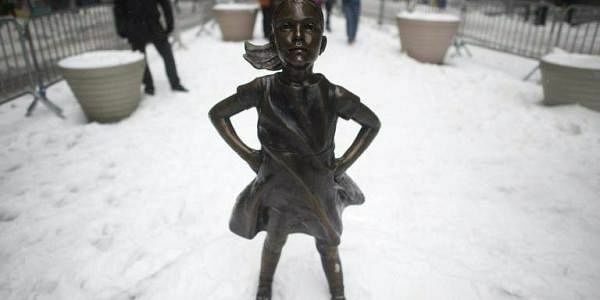 Initially installed on March 7 for one week, the "Fearless Girl" sculpture appeared in media around the world, seen by many as a defiant symbol of women's rights under the new administration of President Donald Trump, who has bragged about sexually assaulting women. The exhibit of artist Kristen Visbal's work was first extended until April 2 and is now set to run until next year's International Women's Day on March 8. "She spoke to the moment," he told reporters in front of the defiant girl. The relevant municipal agencies voted in favor of keeping the statue, he said. The artwork was installed by asset managers State Street Global Advisors, with City Hall's agreement. It marked the start of the firm's campaign to encourage companies in which it invests to increase the number of women on their boards of directors. The young girl faces down the "Charging Bull" sculpture, installed in December 1989 -- also temporarily at first -- by Italian-American artist Arturo Di Modica to symbolize "the strength and power of the American people." It has since become a symbol of Wall Street. Visbal chose to depict a young girl to show others that it is possible for them to forge a career on Wall Street, Manhattan Borough President Gale Brewer said. She was referring to a recent report showing that fewer than 20 percent of board seats of S&P 500 companies are occupied by women. "We can issue all the reports we want," Brewer said, "they will have not have the symbol a sculpture does."